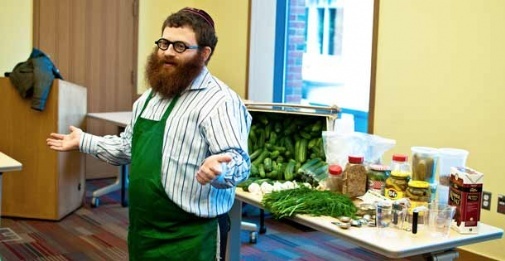 Some years ago New York's own Rabbi Pickle met a former lower east side pickle maker named Moe, who wanted to pass on his traditional technique for making kosher dills to the kids of the congregation. Although Moe has since passed on, his legacy lives on through Rabbi Pickle and children and parents can learn how to make their own kosher pickles in a fun, educational and tasty way! The traveling Kosher pickle factory as led by Rabbi Pickle is a hands on pickle making demonstration that uses the same method as the original pickle masters of the famed Lower East Side of New York. Participants will walk away with their very own container of pickles. During the workshop, participants will also gain an understanding of the kosher lifestyle and gain insight to the deeper meaning of many of the ingredients. The Kosher Pickle factory has traveled extensively throughout the USA and Canada, bringing the joy of the pickle to over 5,000 folks of all ages and we are pleased to have it in Phoenix FOR THE FIRST TIME EVER! RSVP online by using our Program Registration form.